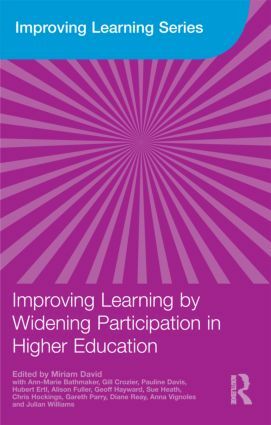 Improving Learning by Widening Participation in Higher Education presents a strong and coherent rationale for improving learning for diverse students from a range of socio-economic, ethnic/racial and gender backgrounds within higher education, and for adults across the life course. Edited by Miriam David, the Associate Director of the ESRC’s highly successful Teaching and Learning Research Programme, with contributions from the seven projects on Widening Participation in Higher Education (viz Gill Crozier and Diane Reay; Chris Hockings; Alison Fuller and Sue Heath; Anna Vignoles; Geoff Hayward and Hubert Ertl; Julian Williams and Pauline Davis; Gareth Parry and Ann-Marie Bathmaker), this book provides clear and comprehensive research evidence on the policies, processes, pedagogies and practices of widening or increasing participation in higher education. This evidence is situated within the contexts of changing individual and institutional circumstances across the life course, and wider international transformations of higher education in relation to the global knowledge economy. how adults view the role of higher education in their lives. This book, based upon both qualitative studies and quantitative datasets, offers a rare insight into the overall implications for current and future policy and will provide a springboard for further research and debate. It will appeal both to policy-makers and practitioners, as well as students within higher education. PART II What does the research tell us? PART III What are the overall implications for both policy and research?